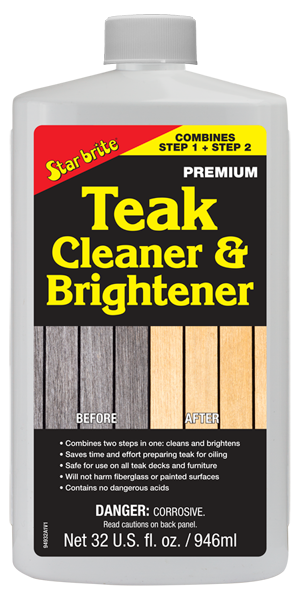 Star brite® Teak Cleaner and Brightener is specially formulated to transform old gray and black stained teak in one step. 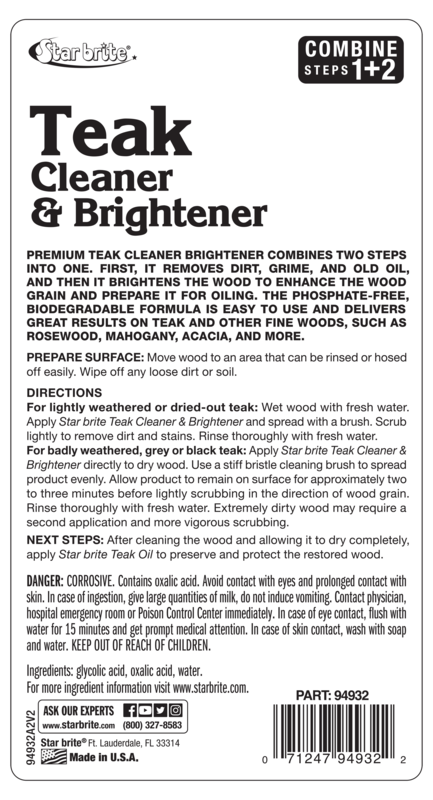 For badly weathered, grey or black teak, apply Teak Cleaner & Brightener directly to dry wood. Use a stiff bristle cleaning brush or Star brite Medium Scrub Pad to spread product evenly. Allow Teak Cleaner & Brightener to remain on surface for approximately two to three minutes before scrubbing. Scrub in the direction of wood grain to ensure deep cleaning before thoroughly rinsing wood with fresh water. Severely dirty or stained wood may require a second application and use of Star brite Stainless Steel Teak Scrub pad. For lightly weathered teak, wet wood with fresh water, apply Teak Cleaner & Brightener, using a bristle brush or medium scrub pad to spread evenly over surface to be treated. Scrub lightly to remove dirt and stains. Rinse thoroughly with fresh water. After cleaning wood, apply Star brite Premium Golden Teak Oil to enhance natural wood color and preserve and protect the restored wood. Rinse off spills and drips onto surfaces not being treated. Avoid contact with fabrics.